The Australian Physiotherapy Association’s Osteoarthritis of the Knee Position Statement (APA OA Knee Position Statement) has reviewed all current relevant literature on the treatment of this condition. Move Well Physiotherapy can provide you with a copy of this position statement if you are interested. The literature review undertaken to produce the APA OA Knee Position statement demonstrates that a variety of studies undertaken conclude that Physiotherapy treatment can be highly effective in the treatment of OA of the knee, with supervised exercise programs being one of the most useful physiotherapy modalities. Joint mobilisations of the affected joints have also been demonstrated to be useful, and together with a structured hydrotherapy program, strengthening exercises, balance exercises, and stretches, the pain of OA of the knee and the function of the affected limb can be greatly improved. Often the degree of OA of the knee demonstrated on X-ray does not correlate with the amount of pain or the limitation in function experienced by the patient. A patient with relatively minor OA changes on X-ray may be quite incapacitated by pain and stiffness, while a patient with hardly any joint space left on X-ray may be quite functional and not complaining of any pain. WHERE DOES OA OF THE KNEE OCCUR? OA of the knee can occur at the patello-femoral joint, the tibio-femoral joint, the superior tib-fib joint, or any combination of the above. 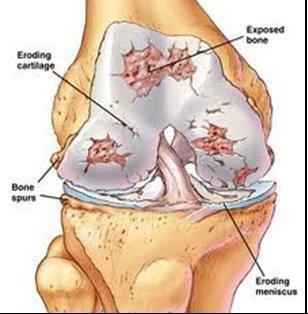 The patient may have knee pain and stiffness, ranging from aching at rest to sharp pain with movement. They may have difficulty going up and down stairs and the knee might feel weak. They might feel clicking or locking or collapsing and they might hear “crunching” as they bend the knee. Conservative treatment such as physiotherapy, can improve and then maintain the patient’s knee function often for many years. Treatment can include mobilizations, exercises, stretches, hydrotherapy and balance exercises. This can delay the need for arthroscopic joint maintenance surgery and, even if this is eventually required, following a clean-out of the OA joint, physiotherapy rehabilitation can then delay, or even prevent, the need for joint replacement surgery.